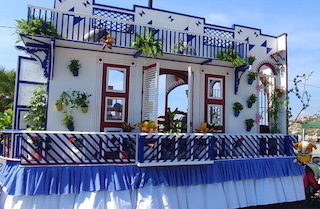 The Romería del Sur in Salobreña this weekend past, went very well and the turnout of colourful floats was spectacular. The procession wound its way down to the beach road with the ox-drawn cart bearing the Virgin leading the way. Some 5,000 people participated in the procession and event with garlanded carts and mounted participants. It was down near the Peñon that the Mass for the Virgen del Rosario was held on a stage. 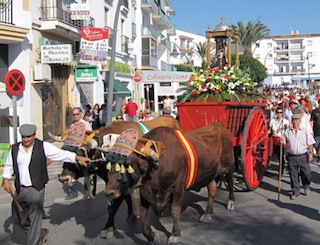 After the Mass the Escuela de Baile Flamenco and the musical trio, Esfera provided entertainment before, later on in the evening, the Virgen was taken back to the shrine, mounted on the ox-drawn cart. This event, despite what the erratic climate throws at us, is almost the official close of summer in Salobreña. This entry was posted on Tuesday, October 2nd, 2018 at 1:29 am	and is filed under Salobreña. You can follow any responses to this entry through the RSS 2.0 feed.